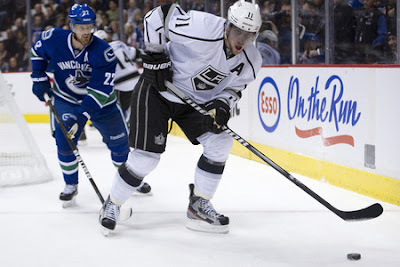 Two years ago, the Canucks finished off the Kings, in Los Angeles, in game six of their first round match up. This year, the Canucks and Kings will once again meet in the first round of the Stanley Cup Playoffs, the second time in three years. Coming into the post season, the two teams were on two very different paths. The Canucks finished the last leg of the season on a torrid run, won their fourth consecutive division title, and wrapped up a second consecutive Presidents' Trophy. On the other side, the Los Angeles Kings struggled to close out the season. The Kings found themselves in first place in the Pacific Division, and in third place in the Western Conference with two games to play. However, they gave up consecutive two goal leads and lost the season's final two games against the San Jose Sharks and dropped from third to eighth place on the last day of the regular season. The Kings have struggled putting the puck in the net all season long, but have gotten better since the trade deadline, when they acquired Jeff Carter from the Columbus Blue Jackets. The bad thing, Carter has missed the last five games with an ankle injury. Carter has been skating with the Kings at practice and seems like he will be ready for the playoffs, which would help the Kings A LOT. Much like the Kings, the Canucks suffered an injury to a star forward, Daniel Sedin, who suffered a concussion, down the stretch. Sedin had recently skated a full practice with his team but missed the team's latest practice which can't be a good sign. The Series will be decided in two categories, special teams and goal-tending. The Kings penalty kill, ranked fourth in the league, has been a bright spot for the Kings and has been successful for prolonged periods of time. If the Kings can keep the Canucks power-play unit off the board and decide the game with five-on-five play they may be able to steal a game or two. Ultimately, both team's success will depend on how well their goalies play. The Canucks' Roberto Luongo, carried his team to the Stanley Cup Finals last season, but has a spotty record in big games in the past. While the Kings' Jonathan Quick has had a Vezina worthy season, posting gaudy numbers with very little support from the team in front of him. Both teams will lean on their goalie, perhaps one more than the other and it may come down to which goalie can carry his team the furthest that decides which team hits the golf course early. 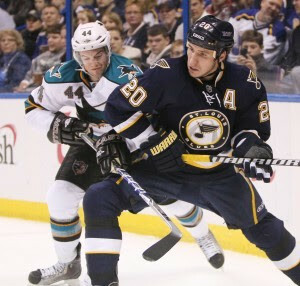 The St. Louis Blues and San Jose Sharks seemed to have switched scripts for the 2011-2012 season. The Sharks came into the season expected by most to be a powerhouse and challenge for both the Western Conference title and Stanley Cup. The Blues were unsure how the season would unfold and if they would even make the playoffs. Oh if hockey were that predictable. The Sharks, after being the Pacific Division powerhouse for much of the last decade were fighting to stay in playoff contention in the final weeks, and are seen by most as having a disappointing season. The Blues have been among the leagues best for most of the season and were fighting for the Presidents' Trophy until the final days of the season. Both teams are coming into the playoffs with out any significant injuries, and will have their full rosters come time for puck drop on Thursday. The Sharks will need to produce this season if they want to keep their organization from going into panic and possibly moving some big pieces over summer. The Sharks have struggled all season against, the Blues. The Blues shutout the Sharks twice and outscored them 11-3. The Sharks will need leaders like Joe Thornton and Patrick Marleu to step up and get this team to produce like so many thought they could. Also, young star Logan Couture will have to continue to prove that he is one of the leagues best young guns and produce when it counts. The Blues will have to continue their stellar defense in order to be successful. Between Jaroslav Halak and Brian Elliott the Blues have allowed the leagues fewest goals and could have the best goalie tandem going into the payoffs. If the Sharks want a chance at winning this series Anti Niemi will have to outplay the Blues' goalies. 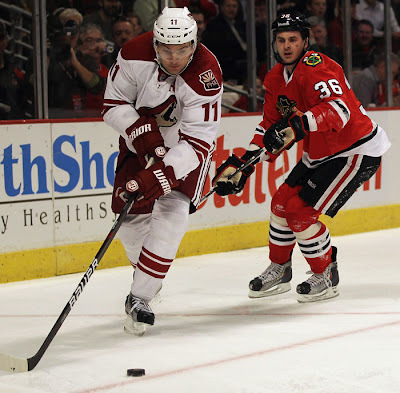 Dave Tippet and the Coyotes seem to continue to do great things will little to nothing to achieve them with. After losing Ilya Brygalov in the off-season, many, including myself, wrote off the Coyotes and their chances at having a productive season. Quite the opposite happened, Mike Smith has risen to the occasion and the Coyotes won their first division title in the franchise's history. The Blackhawks have had a roller coaster of a year. From goalie's under achieving to captains struggling and missing games due to concussions, the Blackhawks have seen it all. However, the Blackhawks have found ways to win and done so in the competitive Central Division, minus Columbus of course. The biggest injury heading into this series is that to Blackhawks captain, Jonathan Toews. Toews has not played a game since Feb. 19 and missed the final 22 games of the Blackhawks' season due to a concussion. 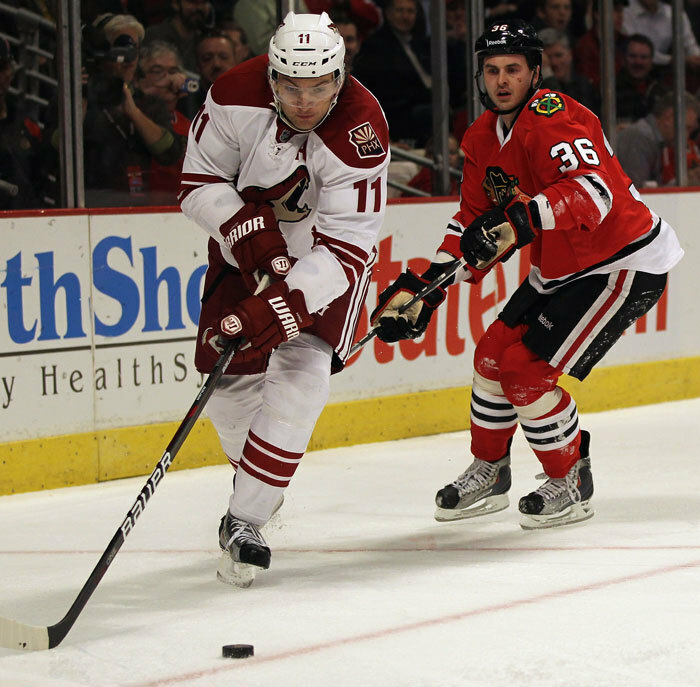 However, Toews has been participating in full practices with his team and seems to be on track for the series' first game in Phoenix. The Blackhawks will need their offensive guns to be present and produce if they want to win this series. Patrick Kane, Marian Hossa, and Toews will have to produce and beat a very hot Mike Smith in order to get out of the first round. With very little secondary scoring and scoring at all, if Smith can't take the pressure and cracks the Coyotes will have a tough time winning their first playoff series since moving to Phoenix. It seems like every season the league is watching the Detroit Red Wings. Not to see if they will make the playoffs, but to see where they will land in the seeding. The Red Wings qualified for the Stanley Cup Playoffs for consecutive season No. 21, yes you read that right 21. They did so with an outlandish home record, which included a 23 game win streak at the Joe. That's nearly as many games as the Blue Jackets won all season! Barry Trotz and the Nashville Predators on the other hand, continued to be Barry Trotz and the Nashville Predators. They won games behind some star defense-man, were anchored by one of the league's top goalies and grabbed home ice advantage while getting little to no recognition for doing it. Ah, the wonders of playing in the Blackhawks' and Red Wings' shadow. 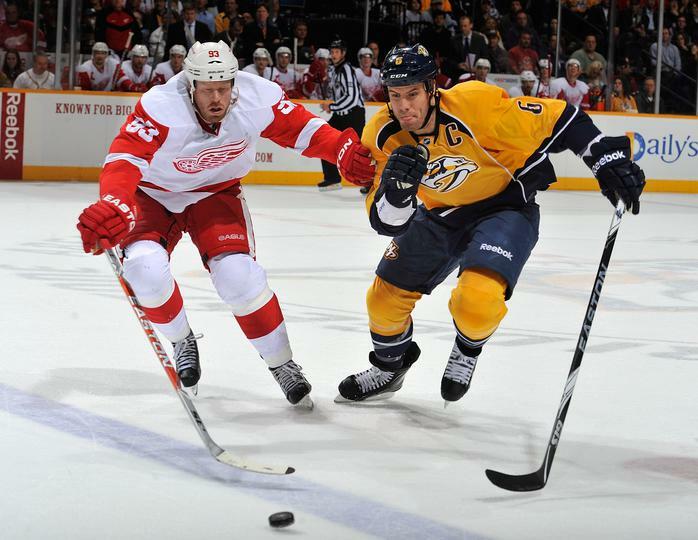 The Predators are healthier than the Red Wings, who have Dan Cleary and Darren Helm out with injuries. But come on, the Red Wings are how old? Its just a matter of time before they get injured. If there was a trophy handed out for experience the Red Wings would win it ever year. There are ten Stanley Cup rings in that locker room, compared to Nashville's one.That alone gives the Red Wings an advantage in any series. With Trotz and Mike Babcock behind their respective benches this could be one of the better coached series' and will have the feeling of a chess match at times. It will come down to the Predators ability to contain the likes of Pavel Datsyuk, Henrik Zetterburg, and Tomas Holmstrom, with Ryan Suter and Shea Weber on the blue line this may not be such a daunting task. The Preds have added some offensive weapons that they did not have in the past in, Alexander Radulov and Andrei Kostitsyn which will help even up the offensive aspect of the game. Pekka Rinne, who has been in talks for the Vezina, will decide this series. If he can anchor the Predators, he can steal a series and get "Smashville" into the second round for a second consecutive year.